"The Ministry will only under exceptional conditions consider granting approval that any additional problem causing animal be destroyed" (MET Press Release 2 June 2014). Although in a completely different area, this recurring monologue from the MET proved to be a futile attempt at pacifying an irate public, as we so clearly saw with the shooting of #Aranos, the elephant who crossed into Southern Namibia earlier this year, and was executed by the MET as a problem animal, despite requests to the MET including the offers of taking full financial responsibility for relocation. There is also the Kamanjab elephant permit - pre-sold by Jan du Plessis of Sebra Hunting as a problem elephant permit (without the elephant even having been identified). Mr. Du Plessis has his own sordid history including his involvement in the pregnant Black Rhino Cow mistakenly hunted in Mangetti, compliments of Thormahlen & Cochran as well as the widely circulated photograph of his son playing with the severed head of a giraffe. It is well-known in conservation circles that a multitude of sins can be hidden under the guise of a problem animal control permit. The permits can appear, suddenly, as if by magic, whenever pesky questions arise - whether it is a lion, an elephant or in the case of Corey Knowlton's propaganda machine, a black rhino. A problem animal is any dangerous animal who may or may not destroy a human settlement, crops and occasionally, kill a person. They may be 'guilty' of destroying water points and / or trampling of a fence and / or killing livestock for food. Because they are a danger they should *a* immediately be investigated by the MET *b* be correctly identified *c* be destroyed as soon as possible . Problem Animal Permits are only valid for a maximum period of two weeks. A 'snipe' hunt is an opportunistic hunt where it means that if the hunting party happens to come across an animal regarded as 'problematic' or 'dangerous', they shoot it first and ask questions later. (Also the relevant permits and paperwork are completed only after the kill, if at all). Recently, an advertisement for the hunting of a Desert Elephant was posted on facebook trophy hunting sites, and on the facebook site of Pro-Hunting Namibia (facebook.com/prohunting). Closer investigation revealed that there had been a third Desert Elephant killed in a hunt last year (photographs of John & Anneli Wamback nestling against the belly of the dead desert elphant is proudly displayed and tagged on their facebook site). The elephant has subsequently been named #ABullCalledHope. He was mowed down by the client Aaron Finch from Ohio, in October 2014. 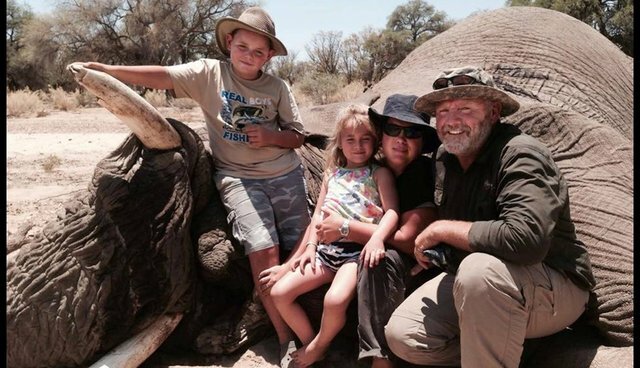 This irresponsible action of publicly advertising the permit to kill one of less than 100 existing Desert Elephants, launched a social media attack on John Wamback, and further investigation was done. "To Shoot an Elephant - by Walt Prothero Obsessed. That's the word for it. It sprouts from longheld desire-after that sunflower-yellow 'Vette, say, or your high school buddy's older sister. Often you can't fill the desire, and later are glad of it. The sister gets ugly, and you can't haul firewood or a deer carcass in a Corvette anyway. ...The elephant obsession simmered with the failures and loomed with the passing years. Unexpected Opportunity We're driving from the Windhoek airport, aimed, I'm certain, at a wilderness backpack leopard hunt. I've hunted them before, with hounds and the traditional safari mode of baiting, but this new method is intriguing. "Got a problem elephant tag," professional hunter John Wamback says. Wamback's an old pal and one of seven active dangerous game professional hunters in Namibia. The government turns to him to deal with problem animals. "Can't get a client for it on such short notice. Wardens will shoot it if we don't, then the natives get no trophy fee." My jet-lagged brain is putting the pieces together in slow motion.I'll let John spell it out. Cheri's eyes dance. "Care to shoot an elephant?" Wamback grins. He's aware of my obsession. "Of course it's a problem elephant hunt, and we must shoot the first bull we encounter." I blink at the surreal Namibian sun outside the Toyota bakkie. "It's a political matter. Natives complain of elephants raiding their cornfields so someone must shoot an elephant to appease them. No matter the bull has never seen a mealie crop, the natives are happy at the meat and none complain to the ministers in the capital. If wardens kill the bull, though, the people get no trophy fee money for HIV medication or school books." I'm fried from thirty-two straight hours in airports and planes and my brain focuses on beds and leopards in that order, and it's incapable of shifting at short notice. "When must I decide?" The decade-old obsession really answers the question, but my soul is lost somewhere in the northern hemisphere and can't help out. "Trophy fee is $10,000, all of which stays in the Caprivi. Entirely up to you, of course, but we must decide so I can grab the permit from the minister today, then it's two days' motoring to the East Caprivi." Three minutes later I say, to no one's surprise, "We should shoot an elephant." John is on the cell locating a hotel. He'll drop us, then he's off to the minister's office for the permit. .....We overnight with professional hunter Izak Grobbelaar and family; he'll help sort out the elephant. .... We collect two Kwe San Bushmen trackers from dismal wattle huts, then arrive at East Caprivi's dusty hub, Katima Mulilo, in the middle of a baking afternoon. We must visit the warden. Here, he's more powerful than the Conservation Minister (equivalent to the U.S. Secretary of the Interior) in Windhoek. The Windhoek minister, it seems, handed Wamback the wrong permit. Phone calls are made, and the minister informs the warden the elephant permit exists and is valid and to allow us to hunt, but the warden's neck stiffens and he won't allow the hunt without a paper copy in hand. "Windhoek is Windhoek, and Caprivi is Caprivi," he says. To complicate matters, the minister's fax machine is down and the warden's office doesn't own one. "Bugger it. They want us to shoot a problem elephant but toss obstacles willy-nilly," Wamback says. Seems an office functionary in Windhoek has the actual copy of the permit and she is shopping for the day. We drive the dusty bustle of Katima streets and John deposits us at a bar. "Get a sandwich and I'll be back." He's on the cell phone hollering at someone in Windhoek as he and Izak drive off. It takes that afternoon and the next day to untangle the red tape. Anneli, John's wife, finally corners the woman with the permit, faxes it to a Katima shop with a fax machine, and John delivers it to the warden. The chief warden assigns a sub-warden to accompany us on the morrow. We're good to go. Almost. Though we can't shoot without the warden, that afternoon we drive narrow paths through bush to native huts searching for leads. People in every hut tell of rogue elephants that send us on snipe hunts; the natives reason that if we do find one, they'll get the meat. If none exist, nothing is lost except our time and petrol. (Elephant killed) The joy is infectious. We leave four hours later; most meat has vaporized and only a dozen men and women worry the carcass. My face is sore from smiling. The next day, only large bones and gut contents litter the sand. Despite the jet-lag and misery and rude functionaries of airports and airlines, the bureaucrats and red tape and politics, the tens of thousands of dollars for a few days of adrenaline, some obsessions are worth it. Sportsafield.com November 2008"
UNQUOTE A full pdf version of the above is available on request. The facebook community dedicated to fighting for these Elephants, is called 'Desert Elephants & Friends'. An avaaz petition to Stop All Hunting of Rare Desert Elephants is also ongoing, in an attempt to save these magnificent Desert Elephants from exploitation and extinction. We have nothing more to add, other than that John Wamback is an absolute disgrace to ethical conservationists everywhere. The only losers here, once again, are the wildlife, while human greed and ego rule.